The Icy Nenana River | Watts Up With That? The last time I was in Alaska, I had the good fortune to stop by the town of Nenana, home of the Nenana River Ice Classic. 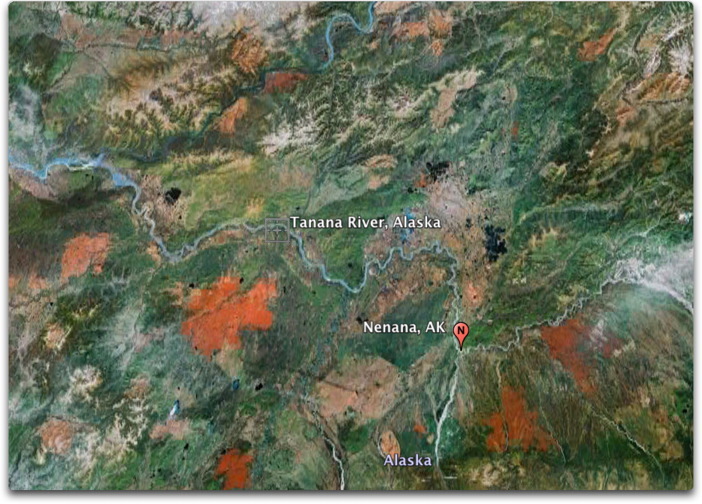 Nenana sits at the junction of the Tanana and Nenana Rivers. The dates of the ice breakup at Nenana form one of the longest-term modern temperature proxies in the area, extending back unbroken to 1917. Figure 1 shows my photo of the tripod which is set out on the ice to determine the exact tim of the breakup. Figure 1. The tower and the tripod. The tripod is placed out on the ice before the breakup. When the ice breaks up, the tripod falls, tripping the clock. These days the tripod is actually a quadripod, or perhaps a quadruped. There’s a recent WUWT post by Psalmon about the Ice Classic here. Although I’d written about it previously, there were a couple of things I didn’t understand about Nenana until I’d visited the place.The first was the reason the ice breakup was so important. It was critical because both then and now, the river is navigable, and becomes a main highway for people and supplies during the summer. Until the breakup, little villages and cabins and camps along the river can’t get their supplies or travel by water. Although this is less important now with the advent of highways, there still are many places along the river that can only be reached by traveling along the river. That made the breakup a huge event in the old days. Figure 2. The Tanana River and its tributaries flow north to the Yukon River. The Yukon flows from the top center to the upper left of the figure, with a portion appearing dark blue. The reason the breakup comes suddenly is that unlike most US rivers, the rivers around Nenana are flowing north. As a result, the more southerly upriver parts of the drainage would tend to melt earlier. 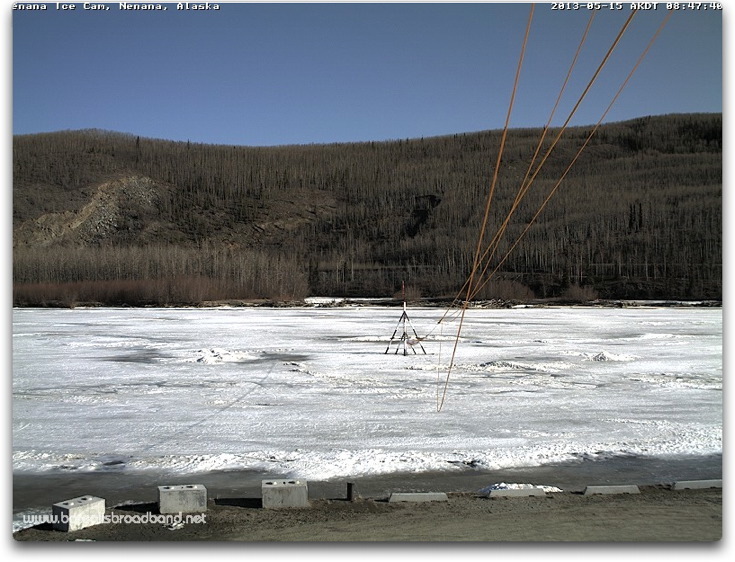 At some point this increasing upstream meltwater will put pressure on the downriver ice, and as the ice at Nenana rots and melts, the whole thing will break and collapse at once. Now, you’d think that the river breakup dates would be a perfect temperature proxy. After all, urban warming surely won’t be an issue. However, nature always sides with the hidden flaw, so of course there is a confounding factor—rain. Rain can hasten the breakup significantly by melting the ice from the top. In addition to starting out warmer than the ice, rainwater pools have less albedo than ice, so they warm more for a given amount of sunlight. Rain also increases the volume of water flowing in the river, so it puts additional pressure on the ice. As a result, the breakup dates form the usual imperfect proxy for temperature. Given all of that, here are the inverse dates of ice breakup since the Classic was first run in 1917. Figure 3. 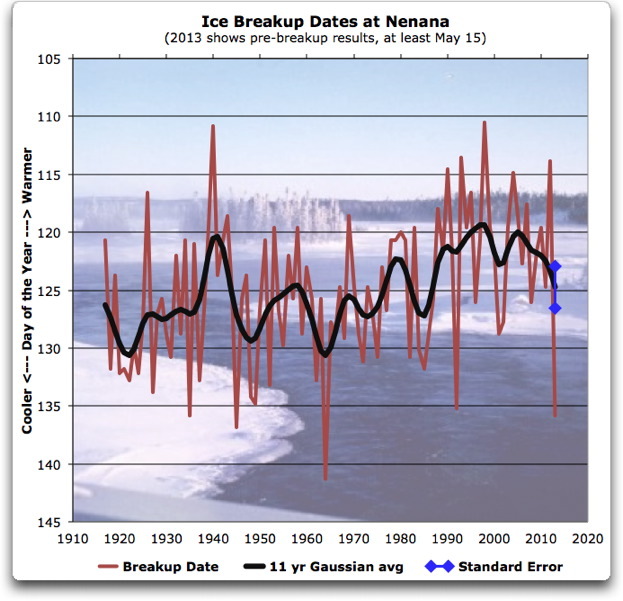 Nenana ice breakup dates since 1917. The result for 2013 will be equal to or greater than today, May 15th. Blue dots show the standard error of the Gaussian average at the endpoint in 2013. For me, it is clear that what we are seeing are the effects of the Pacific Decadal Oscillation. This is a slow, decades long cycle in the heat distribution in the Pacific Ocean. In about 1945 the PDO shifted to the cool phase, then went back to the warm phase in about 1975, and has recently switched again to the cool phase. Overall? I’d say there’s not a whole lot to see in the ice records. Temperatures went up a bit, down a bit, up a bit, and appear to be on their way back down again … be still, my beating heart, it’s all too exciting. 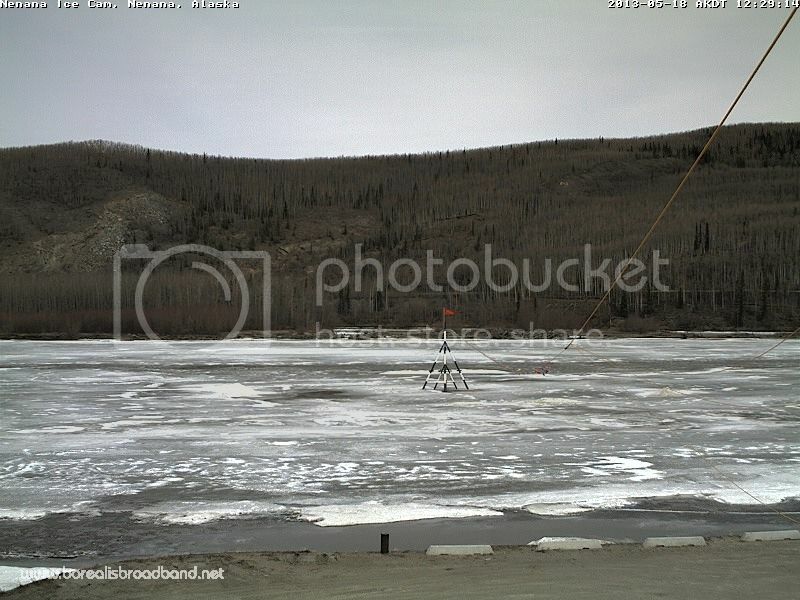 I leave you with the current photo from the Nenana Icecam, at 8:47 Alaska Daylight Time May 15, still no breakup, but goodness, it’s a lovely spring day in Alaska … makes my heart leap just to look at it. DATA: the historical breakup days are available here. ← Global warming whacks Earth's poles – is there anything it can't do? Wow, looking at the breakup dates, Two distribution humps. Suggests an oscillatory system is at work there. It is odd that the later hump has a dip in the middle. Possibly a 3 state system? Who’s the poor SOB who has to go and retrieve the tripod? To appreciate the infantile state of climate science, consider that the PDO wasn’t discovered until 1997, by a Pacific NW fisheries researcher. True that. The PDO has a huge effect on the fisheries of the US and Canadian Pacific Northwest. there cannot be a standard error. In about 4 hours, 2013 will move into the top three latest breakups ever. (As measured by the Nenana Ice Clasic) The latest is 20 May. If CO2 was truly a strong climate driver, I would expect so see it’s fingerprints all over your graph Willis, but you are correct, all I see is a noisy PDO signal. One other thing, you mentioned rain as one of the confounding variables for using this as a temperature proxy. Last year was one of the earliest breakups, and I think what made it early was the absolutely enormous amount of snow that fell last year. The area broke snowfall records early and often. I had around 17 feet at my house, and nearby Anchorage had it’s snowiest year ever. I think the additional insulation from the snow kept the ice from getting very thick. If you look at last years thickness measurements, the ice was not very thick at all, even though that winter was one of the coldest we have had. I wonder if climate science was funded by fisheries and agriculture instead of environmentalists, we would have had any of this carbon-AGW nonsense to begin with? What would be interesting to know is if there are any similar records in Central Canada, Siberia and West of the Urals also? That would give some insight as to whether temperature proxies were even by longitude, even but out of phase or closer to random. Given that AMO is out of phase with PDO, you might expect west of the Urals to be phased, but perhaps Eastern Siberia to be similar to Alaska?? Anyone got enough data sets to answer scientifically? The chart means something to me, so many thanks, Willis. 1. It clearly shows the earth’s climate is variable. 2. It shows the observed warming from the 1930s to the peak in 1940, which appears in many temperature datasets. 3. It shows the observed warming from the early 1980s to about 1997. 4. It shows the ending of the latest “global warming period” and first flattening then declining after 1997. 5. 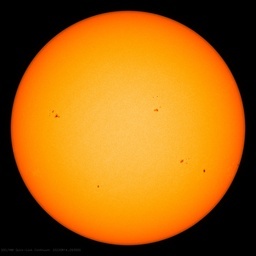 What it does not show is any influence of carbon dioxide from burning fossil fuels at any juncture. I like to cross-check against other data. Looking at HADCRUT3, there was a huge drop in global average temperatures in the mid 1940s, that seemed out of place next to GISSTEMP. These figures are more in line with HADCRUT3. Last year it was early at 7:39 p.m. April 23. In fact the fourth earliest on record. Does anybody know if there was heavy rainfall? This year is already the third fourth or third latest on record. Stopped in Nenana earlier this year for breakfast. I put my money on 5/12 4:30 PM. Looks like I won’t be collecting the cash prize. A quick google and here are ice in/ice out dates for hungary and finland. Surely, someone has collected all the ice out dates available on the web. No? The late John Daly referenced Fairbanks, upriver, as a possible factor in the dates. One of many power plants there consumes more than 210,000 tons of coal a year. Hey! That ice-cam is a terrific thing. I’m thinking about inviting neighbors over to watch for the ice-free moment. This is what life comes to when you retire. Being Alaskans they cannily have attached cables to the tripod so it can be retrieved without having to go wading among the ice chunks. Interesting the tendency to alternate. I’ll have to grab the data and compare to Arctic melting season. Also the arctic alternation comes from a complex pattern of three frequencies close to two years (an amplitude modulation triplet) that means it is not regular every two years. sometimes the pattern skips. The triplet resolves as amplitude modulation of a 2 year cycle by one of 12.83 years. The 2 year is probable some internal flip-flop: more melting causes more snow , which causes less melting the next year. It tends to oscillation. 12.83 is less obvious, but just to note the alignment of Jupiter and Neptune happens every 12.78 years which is within the uncertainty of the detection of the AM triplet. Neptune is the third ranking planet in it’s inertial effect on the sun (Jupiter is first) and hence earth. But that’s tale for another day. Just dug out another version that uses both melting and freezing periods to give a second estimation of melting behaviour. By eye it’s a bit hard from Willis’ graph but it does not look like a close match on year to year scale. Though recent cooling is clear in both. Willis, where did you get the numbers from? Looking at the menu of their site all the links are like : file:///E:\other files\blah…. Some ham fisted windows user messed up and used local file names. If you have a direct URL for the data it would be good to have. We were having so much fun treating this as a temperature proxy! Until you came a along and rained on the parade of articles with math and even history! Next year we WUWT folks should start our own lottery on this even and use your math skills to predict the date of the breakup! Isn’t the Nanunenenunu “tripod” really a tetrapod? The reason for the two humps in the break-up data is probably due to the fact that there is a strong correlation to the ENSO here (from Alaska down down to Minnesota). It has the strongest correlation of any region in fact other than the ENSO regions themselves, Australia and Indonesia. Northwest North America is one of the most impacted regions from the ENSO. Early break-up in El Nino years, late break-up in La Ninas. 3 month lag in effect. There was weak La Nina conditions early in 2013.
if the measurement of the day in the year of break-up is exact, there cannot be a standard error. What error do you want to bring in? For 2013 we are already on 135 and counting. Sorry for the lack of clarity. It’s the standard error of the 11-year gaussian smooth. When you get to the end of the data using a centered 11-year smooth of some kind, the final points are an estimate of the eventual smoothed curve that you will obtain when you have the next five years of data. That estimate, of course, has a standard error which I’ve indicated by the error bars. For a discussion of the issue, see my post “Dr. Michael Mann, Smooth Operator“. If you need some more excitement, I can send you a can of paint to watch dry !! Stopped in Nenana earlier this year for breakfast. Weather – even over a fair-ish chunk of Alaska, which is twice the size of Texas – isn’t climate. But – and Willis, many thanks again! – lots of ‘bits’ of weather make up climate – in enough time. Talking about ENSO and La Nina, the cold SST plume of Peru in the East Pacific at the end of the anomaly animation looks like something from the intro sequence of a James Bond movie just now. Just thought I’d throw this in since this is all about melting ice: just found a striking correlation in recent AO index and rate of change of CO2. Now since out-gassing of sea water is a function of temperature the dip may presage a cold 2013. Most of NH seems to be feeling it already but also a rebound for 2015. Good news since, despite wanting to see an end AGW hysteria, I’m not sure I want pay the price of a replay of the Maunder Minimum to prove the point. Since Willis has already pointed out the tropical oceans are fairly stable in temperature and polar regions are reckoned to show polar amplification of warming, I think this may be where a lot of the increasing CO2 is coming from. Cold water holds a lot more CO2 than warm tropical waters to start with. Now rate of change of CO2 does not cause temperature but the other way around does fit the physics and those wiggles are specific enough for this not to be coincidence. So that dip supports a late melt this year but don’t bet on the same thing next year. What about the run-off of the tributaries upstream ?, if you get enough water flowing under the ice, it will either melt from below or rise enough to loosen its grips on the banks of the river, thus moving the tripod and making someone rather wealthy. No ?? Interesting thought, Fred. Let’s see. The coal is from the Usibelli mines, and that coal has about 1.64e+10 joules per tonne. Then 2e+5 tonnes of coal would have about 3.3e+15 joules of energy. Say 40% is used to generate electricity, so you’d assume that 60%, or 2e+15 joules of heat would be lost, mostly going into the river cooling water. But what John Daly might not have known is that because of the extreme cold, the power plants in Fairbanks are co-generation plants. In addition to electricity, they produce both hot water and steam, for residential, commercial, and city use. So during the time the Nenana River is frozen, much of the waste heat is going to providing steam and hot water rather than to warming the Tanana River. Now, co-generation is typically pretty efficient. So I’d estimate that rather than 60% of the total heat content of the coal going into the river, maybe 10% heats the river water. That’s still a big number, 3.3e14 joules of heat each year. That works out to 9e+11 joules entering the river daily. It takes about 4.2e+6 joules of energy to heat a tonne of water one degree C. So how much water is in the river? Man, I love the web … here’s the Tanana river flow in Fairbanks earlier this month. It was about 25,000 cubic feet per second. That’s about 708 cubic metres per second, which is 6.12e+7 tonnes per day. So now, we have all the information we need. We have 9e+9 joules heating 6.12e+7 tonnes of water each day, at 4.2e+6 joules per degree per ton, crunch the numbers, the Tanana River is warmed about 0.003°C by the power plant … so even if there were ten plants and twice the waste heat per plant, it’s still in the hundredths of a degree. But there aren’t ten power plants upriver of Tanana, there are three. The other two together use about 120,000 tons of coal per year. So the heating is still trivially small. Just now gone past 1935 into third place. Second looks set to go too in another 19 hrs, the ice still looks very solid. I’ve read that to be near a river during ice break-up, is a thing to behold. it’s the only tripod with four legs. Looks like a nonopod to me (one less than the decapods doubtless waiting below to see the sun). With nine legs, its got to be a Nenanapod. The ice break up on the Moose River at Moose Factory, Ontario probably has long record of break up dates. This is also a north flowing river, but at lower latitude. Break up was last week for 2013. Fairbanks gets most of its electricity from burning diesel these days. The Healy clean coal plant has been the center of a decade long pi$$ing contest between Golden Valley Electric (GVEA) (Fairbanks area electric co-op) and the State of Alaska since 2000. It has just recently been transferred to GVEA and may get fired up depending on how hard the EPA fights the air quality permits. One mode of travel in the Bush during the winter is to drive diesel pickups up and down the rivers while they are iced over. Still have to be careful as there are springs. Interior Alaska has more than a little trouble with flooding after break up, as it is not uncommon to get ice dams on the rivers and flood the surrounding countryside. This is the other reason that breakup is monitored closely – first you can’t travel on the ice any more and then the ice and ice cold water comes to visit for a while. PDO oscillating? Well it looks like it mirrors the global temp trace – 1936 high, the following lows, upturn in the 80s and 90s to 1997-98 and then curving downward into cooler temps. Since it is argued that that global temp curve is a signature of CO2 increase (except for after 1997 – a pretty damning blow to CO2), I guess faithful can argue its mainly CO2 and the darn ocean began swallowing heat (for some reason) after 1997. Or, all we need are the oceanic oscillations to explain the whole shitteree. “As I said in the head post, DATA: the historical breakup days are available here.” Awe crap , you mean I have to go through and format it all by hand ! BTW last years data seems to be missing ? Did you find it ? Under the “Ice” heading of their website, they have weekly ice thickness records from January through May (or until breakup) for every week for every year since 1989. A quick look shows no significant pattern, nor any visible changes from this year to the two recent years of most significant Arctic Ocean minimum sea ice extent: 2007 and 2012. So, is minimum Arctic sea ice extents really indicative of any “temperature proxy” anywhere else in the Arctic at all? warming as opposed to the bantied-about 15-17 years. OK, it’s a PITA but I parsed it all by hand including silliness like 12:04 AM (duh) and I have a plot remarkably similar to yours Willis. And you know what I think we have a volcano effect ! Mt Agung and Mt P seems well marked by a sharp neg. spike. El Chichon has big trough but perhaps attribution is a bit more dubious. Thanks for the thought Willis but I’d already done it, including the hour. No, minimum ice area/extent is a propaganda tool. Why focalise on one day per year when there is 365 days worth of data? Warmists like the Sept min since it is more dramatic now there is a bigger annual variation. However, if you want to look at how Arctic melting / freezing is varying in time use all the daily data, not one dot per year. And best try looking at rate of change if you are interested in the change. Not much sign of “run away melting” there so I guess it must be a net negative feedback. The graph appears to me reasonably honest. It appears to me as usable to support a contention for a warming trend, or for lack of warming in the past 25 years. Thanks, Donald. The earth is warming or cooling or flat depending on the period chosen. Keep in mind that this is a specific location, as opposed to a region or the world as a whole. Well, it’s not a specific location so much as a specific large area, the drainage of the Tanana River and its tributaries, which like everything in Alaska is oversized. You are correct that it is not the world, but it’s not like a single weather station either. I would give more weight to satellite-based determinations of global lower troposphere temperature. I see those, despite the century-class 1998 spike, indicating 12 years of lack of warming as opposed to the bantied-about 15-17 years. I suspect your 12-year result reflects a lack of adjustment for autocorrelation. Trendless autocorrelated series tend to wander more widely than equivalent random normal series. In other words, autocorrelated series (like say satellite temperatures) are naturally trendy, but those trends mean nothing—they are just random fluctuations. As a result, you have to adjust for the autocorrelation to determine if a given trend is statistically significant or not. For the UAH satellite data, the lag-1 autocorrelation is 0.85, which is quite high. I just took a look at the latest UAH satellite data. Adjusted for autocorrelation (using the method of Nychka), you have to go back to April of 1994 to find a significant trend … nineteen years and counting. Not that I think manmade global warming exists to the degree that most advocates of its existence insist upon, but I see that it exists, as surely as a roughly ~65 year (if temporarily so) natural cycle – which shows up well in HadCRUT3. Your claim would have a chance of being convincing if you had something other than your own eyes to attest to the claimed existence of man-made warming … or even if you told us what your eyes see that convinces you of its reality. Interesting thoughts, Greg. Well, El Chichon was in 1982. Since according to the breakup dates 1983 was warmer than 1982, I would agree with the claim that it is “dubious” that El Chichon would have raised the AK temperature. As someone remarked above, the jagged pattern reverses sharply every year or two. If we model it as an ARIMA process, we get coefficients of ar = 0.942, ma = – 0.864, where possible values range from -1.0 to 1.0. The large negative moving average (ma) coefficient of minus 0.85 reflects this rapid reversal of anomaly value. As a result, if you pick three years at random, you’ve got a good chance that two out of three fall at or near a peak with a large fall after it … which is what we find here. I find that poor support for a volcanic effect. PS: Thanks for the coding including the hours. How can you be so sure of that? Of course temperature records are autocorrelated , that is what happens when you add energy to a system. Random and “stochastic” are often just used excuses for what we have not understood or to dismiss everything apart from AGW as “noise”. Nychka: Never treat as unintelligible noise what you could otherwise treat as an intelligible signal. Both Mt Agung and Mt Pinatubo are notable deviations from the surrounding data. It could be coincidental but it merits consideration. Some caution is needed with using statistical arguments to throw everything out. It is fine if something can be shown to ‘statistically significant’ to whatever level of confidence by comparison to random noise, or red noise of whatever your favourite colour is. However, the opposite is not a proof that the observed effect IS random variation, simply that it is not strong enough to be certain that it is not without further study. Some real effects can be smaller than the 95% confidence level . That does not mean they are not real. One thing seems clear is that if those spikes are attributable to volcanism, they do not induce any permanent offset in this as a temperature proxy. Now correlation is not causation but there is some wide ranging effect there if it’s affecting AK river melting and MLO CO2 conc. The other interesting thing about Ice Classic as a temp proxy is that it shows a strong WWII bump. The one that Folland’s folly tried to remove half of. ie AK does show an early rise roughly equal to the post war drop. Have a look at the second graph here. I had good data from the Elmendorff weather station in Anchorage. We are cooling. Globally. That has implications. It will get both drier and cooler up north. Less weather. On my scale we are now in 1925. So we can predict that for the next 5 years it will be the same as it was from 1925 to 1930. Perhaps I should place a bet? How do I do that from a foreign country. If I were living in Alaska I’d pack my bags and move south (below 40)! btw what happened in 2012? Is 2012 on your graph, Willis? Is that the last reading? 2012 ? looks like 136? The cooling trend from 2010 looks frightening to me. The Torne River is a river in northern Sweden and Finland. Sorry for the confusion, let me try again. Perfectly random autocorrelated series are more trendy than perfectly random non-autocorrelated series. It’s the nature of the beast. Because autocorrelated series are naturally trendy, a trend that would be statistically significant in a random non-autocorrelated series may be fairly common in an autocorrelated series. That’s what I meant when I said they “mean nothing”. A trend that means something if the data were normal can be just random fluctuations in an autocorrelated dataset. You ask how we can be sure of that. With the computer language R, it’s easy to generate random normal as well as ARIMA (autocorrelated) datasets, and compare the trends. If you do so, you’ll find that random autocorrelated datasets naturally exhibit greater (and longer lasting) trends than do random normal datasets, and so you have to adjust for that when you are calculating statistical significance. With 7 hours to go to reach the 2nd latest breakup date, there are pools of water forming on the top of the ice near the Tripod. Can’t be far away now. Can it last 7 hours? W: “Sorry for the confusion, let me try again. Thanks, put like that it makes sense. That would be another interesting series but the link does not work , could you check that it got posted correctly? When you retire you will probably be able to paint your roof tiles and run all you electrical appliances from it. hey, it’s official with NOAA. Wish I’d found that page last night , it’ve saved me a couple of hours eye strain and time wasting. It’s a bit after 4 AM there, 29F, light winds. Temp by 10AM would be around 42F with partly cloudy skies. It looks pretty safe to beat the old 2nd-place record of 9:41. With a high in the low 50s predicted today, and some showers tonight (changing to snow showers later), it probably won’t make it to tomorrow, but if it does, colder temps are coming in – only in the 30s tomorrow, so could last til the weekend. Shifted AO index seems to correlate quite well with ice classic during cooling periods. A different lag may be appropriate for the warming period. Early cooling fits well until about 1967-68 then there’s a shift. It comes back to this same lag between 1994 and 1997. That would indicate, at least as far as this region is concerned that the late 20th global warming ended around that time. It seems that these back-road climate indicators are telling us the same thing. They have not been ” adjusted ” yet. Wait ’til next year they’ll be a [strike] hit squad [/strike] consensus of “scientists” from SkS out there “adjusting” the ice with sledge hammers. The increase from 2012 (113) to 2013 (136?) is definitely significant. A similar thing happened from 1926 to 1927, namely from 116 to 133. It is a large difference. It means less moisture is now available for the higher latitudes, in line with global cooling…. Global cooling is happening, starting to show more at the top of the world. BTW the lag is nice , it gives a short term prediction tool. Next year will be well on its way back. The peak is in 2015. Or perhaps not so regional if MLO CO2 concentrations are saying the same thing. I think we all forgot to make a correction for leap years? “You misspelled Nenana” , thanks. 2012 was a leap year. that makes it 114 days for 2012. I thought it was 113.
did you take that CO2 data from Barrow, Alaska? I did not have 2012 when I posted above but checking my data I have 114.501 days for 2012. CO2 data is Mauna Loa Obervatory , regarded as “well mixex” global or at least NH average. That makes the correlation between d/dt(CO2) and arctic oscillation index all the more remarkable. Heh, go and explain the problem to mainstream climatologists. Fitting linear “trends” to runny means of non linear systems has been the mainstay of climate science for the last 30 years. We know! We r all watching. Proof that CO2 does not drive climate…..at all…. Well, it is already #2 on the all time list. 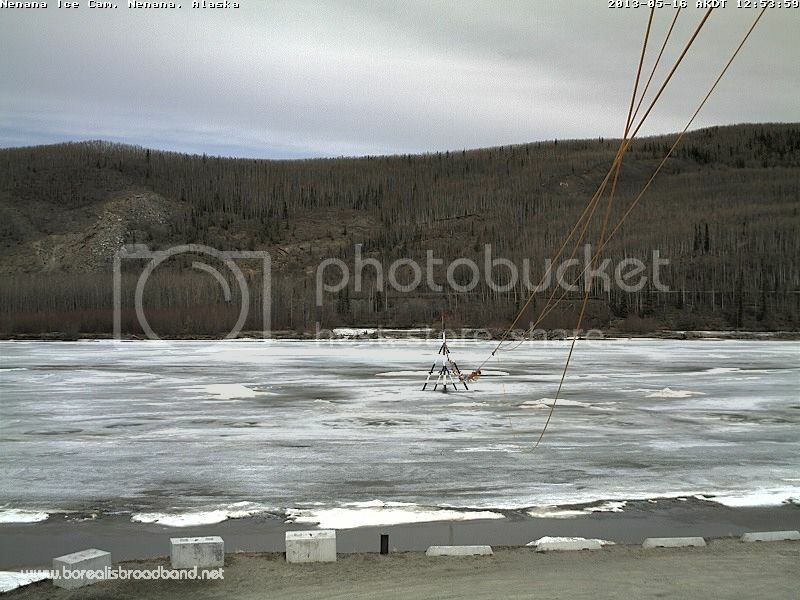 Anthony needs to put the Nenana Cam on the WUWT home page so we can root it on over the weekend. Go, ice, go!! I’m guessing this is giving Nenana Alaska the biggest boost in notoriety they’ve ever had. I know I had never heard of the place before now. T-minus 25 min. now to break the 2nd-place record. Clearly you don’t understand. Global cooling is a serious problem. The dust bowl drought will follow in about six years. You guys do not realize the seriousness of the situation yet. Done! This year is now in 2nd place. Torne (Tornio) river ice break up dates extend back to 1693. Publication: Loader, N., Jalkanen, R., McCarroll, D. & Moberg, A. 2011. Spring temperature variability in Northern Fennoscandia AD1693–2011 (pdf). Journal of Quaternary Science 26(6) 566–570. Over the last 300 years the temperature has increased 2.5 degrees. Forecast for Nenana, AK. Rain/snow tomorrow – high 38F. Cooler Saturday, high 35 F. Lows below freezing each night through the weekend. Go, ice, go!! Frank K: Don’t you mean “stay, ice, stay!!”? I also wonder now! Perhaps Frank is a warmist? It’s about a dumb as warmists wanting the world to self-destruct so that they can make us do something save it. They are cheering on for a total melt down in the Arctic so that we have to let them dictate our lives. Then , and only then will they start to want global warming to stop. No no, guys! I’m rooting for the ice to hang on over the weekend so they’ll have a new all time record at Nenana. And no, I don’t wish there to be another ice age. I’m simply lampooning the fact that every time some heat “record” is broken, our esteemed scientific establishment uses it as a proxy for unprecedented human-caused global climate change. Now we have a well-established event that goes against the CAGW orthodoxy – let’s see how they spin it. I’m sure you’ll see big headline in all of the major newspapers, right? The wind is really blowing up here guys, I don’t know if that will affect the ice or not. If the ice lasts until tomorrow, there is a very cold air mass moving into the area, If the ice makes it another 24 hours, I think there is a real shot at the record. Dana’s on his way with on his moped and Super Mandia is flying up on his hockey stick. Believe me, they’re not going to let this happen ! The cooling could become a problem though. Best to move more towards the equator and start farming there. I wonder if anyone who entered the contest bet on a new record??? At $2.50 a guess I would have entered a guess for every 6 hours past the 10th of May until a week past the oldest record. Looking at some of the posts above and following the link for the ice breakup on the tornio river, I also found an interesting chart on permafrost temperatures. I find it interesting that they cut off the chart at 1995. I have not been able to find a continuous series of permafrost temperatures at a specific location that spans the period from 1950 to date. I wonder what a current data plot would show is happening to permafrost temperatures at depth in say Fairbanks Alaska over that 60+ year time span? The ice is getting rotten in a hurry – looks like it will be out tomorrow. anyone know how to copy an image to the comments? I refreshed the ice cam at Nenana and got a whole heap of bikies standing around. Thought it might be cool to share. Steve , AFAIK mere mortals cannot include an image in a comment. I gave up long ago. Some manage to get youtube links in but I’ve never tried that. I think only those with posting articles can add images to comments. It’s a shame because it breaks up lone masses of text. Looks like the Nenana ice breakup is at least 2nd all-time now, because the ice is still there. Time slug on the Web cam is 03:27:32 AM, 17 May, Alaska Daylight Time. Can it make it past Monday and set a new record? Atfer a lot of digging, some online OCR and editing I finally have a numerical time series for the Tornio river break-up dates. Similar to Nenana here. Can it make it past Monday and set a new record? it looks to me like some water there on the left hand side of the tripod? By the way, I was looking at the forecast temperatures at Nenana, AK, and they make set a new low temperature record over the weekend…stay tuned. Well done, I looked but found only their resulting temperature prediction, which is here. A minor note, you have two “1991” years in the dataset, and no 1993. Anchorage AK-All I can say is it is damn cold up here-we are forecast to get about 6 inches of snow Friday/Saturday. The last 3/4 years have been cold and wet. The picture of the tripod with the blue sky must be a Chamber of Commerce pix! I don’t know if it will make it to Monday or not, but the watery ice got a nice coat of white lipstick over night as surface water froze. I think though that the flowing water in the center channel under the ice is the primary force that causes break-up. As it erodes the bottom closer to shore where the ice hugs to the river bed, the whole mass will start to move slightly causing massive cracking, then catastrophic break up. My questions are: How cold is the flowing water? How much is the water flowing? How much heat can the open water upstream of the ice pack lose if a cold front moves in? This will be interesting. Watch for record low temperatures tomorrow morning (near 20F). Right now it’s overcast, and there is a cold rain/snow in the forecast, high only in the mid 30s. I think it’ll break up on Sunday…but who knows? It looks like a few cracks are developing near the shore and pointing to the center of the river. But I have no idea how long it takes to get from a few cracks to full break-up? Anchorage AK-All I can say is it is damn cold up here-we are forecast to get about 6 inches of snow Friday/Saturday. The last 3/4 years have been cold and wet. It is not going to get better anytime soon up there > 40…. CO2 unlikely to have any influence…;. With temps below freezing this weekend (teens at night), it now looks like the vigil will be Monday to see if the tripod makes it thru Tuesday. With highs next week in the 60s and temps all above freezing, the contest will almost certainly end (despite dreams of summer ice fishing by some). You must admit, he’s never wrong. Tornio river break-up dates. Similar to Nenana here. Unlike instrumental records consisting of numerical values of a variable for a given time, obtined by using a more or less well-calibrated instrument, cryofenological records consist of verbal expressions referring to an event that occured at a given time. The expressions are of different lenght, from single words to several long sentences. So it is not trivial to find out what is the actual date of break-up. The expressons are also in two languages finnish and swedish. Almost 4 pm Friday, still standing. Would be fun if it beat the old record. In 2003, “at least 19 tickets” had the exact time of 6:22PM on the day of the breakup. The pop was about the same size as this year, a bit over $300k. It would be interesting to see a graph of the ticket guesses for the current year, and see how many people guessed (based on the very gold winter) that the breakup would be unusually late. It appears that, ten years ago, they organized the tickets by time bucket and only did data entry on the ones that had the right time. I don’t know what their current practice is. Looks like the ice is setting up again as the cold sets in. 18:51 AKDT and still frozen. When exactly would the record be broken? Thanks, but are you sure? the record for 1964 was 20th of May. 1964 was a leap year, and the equivalent time in days in 2013 would be 21 May? what is the rule, for the record? “Thanks, but are you sure? the record for 1964 was 20th of May. HenryP, this brilliant detailed bit shows why one can’t get away with much these days with a world-wide crowdsourcing critique awaiting them. It has proven the downfall of sloppy climate science and promises to be the real incorruptible peer review of future scientific work that has to be paid attention to. Now this detail you point out is only a small one but it proves the point nicely. It is 07:45 on 2013-May-18 as I write this and the tripod is still up. But we must get the leap-year stuff right! Today’s high here in North Pole (just outside of Fairbanks) is 26.9 °F, last year on this day the high temperature was 68.8 °F. We have had 45 straight days of colder than average temperatures. Migratory birds have stacked up and are arriving out of their usual sequence, insects haven’t made their usual appearance, trees have failed to bud, moose are hungry…I’m using a lot (a lot) of firewood. For what it’s worth, I chose April 28th @ 2:28am for my ticket in the Ice Classic. I may drive to Nenana for lunch tomorrow. The Monderosa Grill, a couple of miles North of Nenana has a great burgers. On another note, I missed 1964 by a single year, but it must have been a rough year with the Good Friday earthquake and a super cold winter. Today’s high here in North Pole (just outside of Fairbanks) is 26.9 °F, last year on this day the high temperature was 68.8 °F. We have had 45 straight days of colder than average temperatures. Migratory birds have stacked up and are arriving out of their usual sequence, insects haven’t made their usual appearance, trees have failed to bud, moose are hungry…I’m using a lot (a lot) of firewood. Is wonder if any body knows how many % tickets left as of to day. In the earlier pic above there are 4 lines out to the marker. In the last pic there is only one. Any idea why that is? Was that Dr. Gleick’s car there a little while ago? Was that him throwing rock salt onto the ice? Dr. Kramm, that pretty well nails it. On a personal note, I’ve read your comments in our local paper with great interest. A tip of the hat to you sir. When I gave a presentation on the climate of Alaska before the Joint Alaska Climate Impact Assessment Commission in April 2007 I also discussed the paper of Sagarin and Micheli (2001), Climate Change in Nontraditional Data Sets, Science Mag. 294, p. 811, as a typical example of foolish statistics used in climatology. These authors only considered the temperature records of Fairbanks from 1949 – 2000 even though the record started in 1906. But around 1949 the annually averaged temperature in the Fairbanks record was relatively low. The linear trend in the Fairbanks data was adopted for the temperature record of Nenana to fill a gap of observations between 1955 and 1975 even though there was a jump in the temperature record of Fairbanks in 1976 due to a regime shift usually related to the PDO (see Hartmenn and Wendler, 2005, http://climate.gi.alaska.edu/ResearchProjects/Hartmann%20and%20Wendler%202005.pdf). Before and after this temperature jump there was always a slight decrease of the temperature (see Fig. 5 of Hartmann and Wendler, 2005). This means that this linear long-term did not represent the Fairbanks record in an adequate manner. Somebody moved the 3x large concrete blocks that used to be on the left edge of the parking lot. A question was raised above about the number of lines, and whether they had changed. No. There were 4x lines, 3 above and one below, then they all get twisted together into one about at the 2/3 point into a single larger line. You can see all 4 in the first picture, and in today’s live webcam view. But! the Nanananonopod has moved to the right with respect to the camera pole – I assume that the camera is fixed and has not itself moved over in the parking lot. Now, our winter tires will become all season tires. Little bit of sunshine left in the web-camera. Hmmmmn. Looks like a fresh dark, jagged line down through the middle of the river ice though. Odd. Did the third rope fall/grow slack? The reflection of the top of the tripod in the water on the front edge of the river, has shifted about 3 feet down stream toward the right. It used to align with the left side fork lift slot in the concrete car stop now it is almost to the right slot. The cables are more slack than before so it made some progress toward the near bank as well as down stream, the ice is starting to plasticity deform as it softens up some. There is a lot going on in those webcam pics, as RACook and Richard Holle point out. The concrete blocks have been mysteriously moved, and they looked pretty heavy. And in studying the lines going out to the Nenanapod, the middle pic looks like they’re connected lower on the pod than in the bottom pic. May be an optical illusion. Also, it looks like lines are completely missing in the last frame of the series. There is one single faint line in the lower right corner of the bottom pic; hard to see it. Maybe it’s the wind. The bottom pic shows the flag unfurled, while the other pics show a limp flag. And in the current live webcam, there are 4 lines at the moment, if you count the thick vertical one [these change when the picture is captured at different times, when someone clicks on the live webcam link]. HenryP said “1964 was a leap year, and the equivalent time in days in 2013 would be 21 May?”, and has been praised for this analysis. 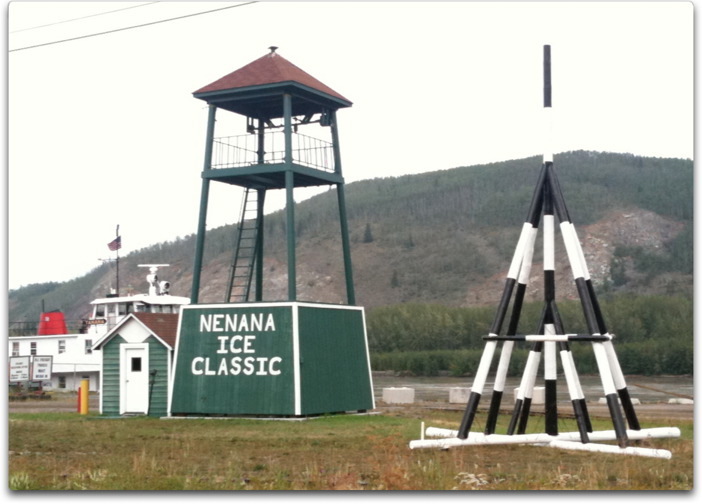 But since minutes count for the Nenana sweepstake, so should they for the measurement of the record. So we should be measuring astronomically, with reference to the time since the vernal equinox. A first cut would say that since 2013 is one year after a leap year, the equinox occurred about 6 hours later than in 2012, so instead of May 20th 11:41am we should set the target to be May 20th 5:41pm. 1410UT and 2013’s was at 1102UT. Therefore we should subtract 3h08m from the target time. I therefore declare that 2013’s ice break-up will be a record if it occurs later than May 20th 8:33am. There is definitely a wind blowing with the lines swinging around. ATM the tripod looks like it is sinking in the ice but after comparing it must be an optical illusion. What I do is look at the top pole in reference to a tree behind it. It is the same now as in the first of Willis’s pics. In regards to Henry P, it doesn’t matter one zoot what the actual number of days, hours and minutes are different from 1964 to 2013, The Pool asks for date and time so if it lasts past 20th May at 9:17 then it is a record. Steve B: for the calendar record, where do you get 9:17 from? The data I saw said 11:41am. But astronomically rather than calendrically, it is 8:33am as per my calculation above. surely we are on PST in Alaska? Surely we count days from the 1st of the year? 1) so instead of May 20th 11:41am we should set the target to be May 20th 5:41pm. 2) Therefore we should subtract 3h08m from the target time. I therefore declare that 2013′s ice break-up will be a record if it occurs later than May 20th 8:33am. where does your 09h17 come from? Leap years add an extra day. Has this been considered in your analysis? OK, I’ll explain again. Ignore my “first cut” which gave 5:41pm. This assumed that the vernal equinox in 1964 and 2012 was at the same time, since both were leap years, and that the equinox in 2013 would then have been about six hours later, hence 11:41am+6:00 = 5:41pm. That calculation was something one could do without access to actual data, other than knowing that the year is about 365.25 days long. The second cut used actual data which showed that the equinox in 2013 was 3:08 hours _before_ that in 1964. There is a drift in equinox times which means that one can’t simply say “leap years add an extra day”. If there had not been a leap day in 2000, like there wasn’t in 1900 nor will be in 2100, then 2013’s equinox would have been 24-3:08 = 20:52h _after_ 1964’s. But as it stands the time-after-equinox comparison between 11:41am in 1964 and 2013 is 11:41am-3:08 = 8:33am. “UT” is Universal Time, or Greenwich Mean Time (roughly), and is a standard for specifying date/times. I’m sure Willis didn’t say, and I have been then confused by some commenters, but which way is the river flowing? I think it is from right to left according to the Nenana city map, but as said, I thought I’d seen some comments suggesting the opposite. Flows right to left into the Yukon. At first I thought that that widening black line in the center of the ice was a crack. But might it be a shallow water channel on top of the ice draining surface water in the direction of the river’s flow? If that is the case it will eventually carve its way through the ice. Can you folks who watch this ice break up every year tell us more about what the conditions are like just before the break up? But as it stands the time-after-equinox comparison between 11:41am in 1964 and 2013 is 11:41am-3:08 = 8:33am. thx. I think I get what you are saying. if you look at the amount of daylight exposure over the two periods of time. Is this correct? Does everyone agree? when is the water going to break? but is there a puddle of water exactly underneath the tripod? it is icing up again! look at those icicles on the ropes! i think this guy with the cam could have made a million bucks (>$315000) if they had put some advert in front of those bricks …. Well, you called it just about right Willis. Today’s high here in North Pole was 70.4 °F, forecast for 75 °F through the weekend, with next Wednesday forecast to hit 85 °F. The sun is just setting, but as you know it won’t really get dark, a shame tonight as the POES Auroral Activity website ( http://www.swpc.noaa.gov/pmap/pmapN.html ) shows enough activity that we would have a pretty good light show tonight if it were dark…but I’ll forgo the light show and enjoy the warmth. On another note, a local professor of forest ecology at the University of Alaska Fairbanks made a big issue of the leap year, disputing that this year’s breakup was record breaking. Dr. Kramm offered his usual insightful comments. Today the Fairbanks Daily News Miner ran an editorial titled “Ice record? Astronomical markers provide best measure”, showing that the debate simmers along.